Medieval Castle Blog: Spooky Stories From Medieval Castles On Halloween! Spooky Stories From Medieval Castles On Halloween! On a personal note, one of the most 'spooky' castles I have ever visited has to be Hermitage Castle in Scotland. It is difficult to explain but the moment you set eyes on the castle it really grips you and holds your attention. It has a powerful, eery appearance and when you see it close up and then enter inside the ruins the atmosphere is very intense. Hermitage Castle is set close to a river, in open countryside and with views to distant fields and hills all around. It has to be one of the most distinctive of medieval castles I have ever seen - though not one that I would relish revisiting. There was a coldness to it that even now is clear in the memory as I write this post. 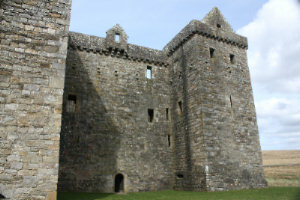 See our dedicated page on Hermitage Castle and read about 2 of its ghost stories.